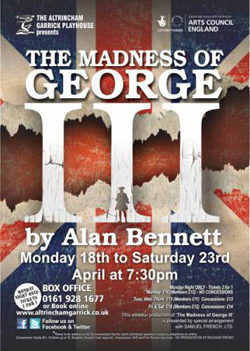 This award winning play by Alan Bennett is billed as a ‘mix of terror, comedy and tragedy’ is a story based on King George III’s well documented bout of madness and the ensuing political power struggle. We see Fox ‘courting’ the scheming Prince of Wales, encouraging him to incarcerate the King, supposedly for his own good health but really so they both benefit - as taking on the role of ‘Prince Regent’ would therefore offer greater political power and access to the treasury coffers. If it is proved that the King is losing his mind, then he will lose his power too. The King, played brilliantly by Nick Sample is subjected to the indignity of constant prodding & poking – both mental and physical torture - from a team of Quacks (Doctors, including the King’s own physician and one conveniently provided by the Prince of Wales). Some of the barbaric procedures include being bled, blistered and restrained, the stools from his bedpan being examined as a constant talking point, being tied to a chair and straight jacketed. None can determine the exact cause of the problem, and each has his own reason to determine madness or not! Sat in the delightful Garrick Theatre in the week of Queen Elizabeth II's 90th birthday, and being invited to look into the political manoeuvrings between an emerging Parliament and the Court of a declining Monarchical institution was certainly poignant. The modern, inviting, and very friendly Garrick contrasted starkly with the stage setting stripped bare to show the cold and calculating harshness of King George III's decline into madness. 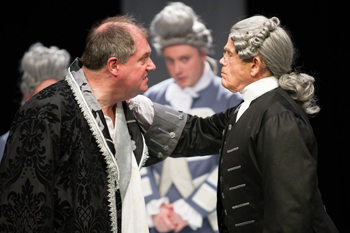 Although not fully explored in the script, Alan Bennett's continual references to America's independence from Britain that so troubled King George III, was the contextual backdrop reminding the audience of a wider decline Britain is to experience, what what. In the First Act the comic lines seemed to miss their mark and poignancy, perhaps because of first night timing issues or more worryingly the cast lacked conviction that they were truly funny – the swearing and name calling did though go down well. As the play progressed however, the timing seemed to click and lines were delivered more naturally and with confidence, gratefully received by the audience. Some jokes/puns were extremely subtle and very well thought through, and deftly weaved into the story. King George III's literal piss take of his GP's references to the contents of his chamber pot (Piss/Pitt the Elder & Younger) were a blast and opened up the convenient and catch-all diagnosis of his madness to scepticism, as his character was given depth and warmth. There were quite a lot of references to the King’s bodily functions but they worked well, and besides toilet humour well done never fails to raise a giggle. King Lear: Clever inclusion of Shakespeare King Lear – as the King is recovering he gets Dr Willis & one of the Lords to act out King Lear and the scene is where King Lear awakes from madness – a good comparison for the state of George’s mind at that point. Dr Francis Willis: Martin Oldfield Takes no prisoners, using restraints and aim to ‘break in’ the King takes no regard of the King’s power/position is there to do a job regardless – obviously no confidence in the other 3 attending Drs, who have agreed that they will unite against Dr Willis, but realises he has to give a little – he produces a daily bulletin but not in consultation, as the others wanted. Pitt : (Steven Finney) Good solid performance, confident, clear but the character a little too aloof perhaps. Know it was constantly referred to that he was a cold fish, but seemed to have a lack of concern for the King whilst incarcerated, especially as he needed the king in good health to ensure the safety/continuance of his own career. He apparently visited the King once a week, but expressed no real compassion or concern at the King’s treatment – could this be to do with the fact that his father went ‘Mad’ & he didn’t want to have to re-kindle thoughts of him. It was the Prince of Wales – now Prince Regent who sent his father away and forbade his mother to visit, but surely Pitt could have done more to ensure the King’s wellbeing. Lady Pembroke (Meg Royle): Her mother also went ‘Mad’ and informed Pitt that a Dr Willis cured her and gave him contact details for him. Did she discuss this with the Queen or did she just take it upon herself to do this – wasn’t explained how Pitt managed to get Prince Regent to allow Willis to get involved as he already had his own doctor and another who were there treating the King on his authority – i.e. will be declared Mad. So not sure how Pitt managed to do this. All elements extremely good, well thought out and executed – House of Commons scene great use of lighting just the two opposing members in spotlight delivering their speeches with the sound of murmurs, objections etc from the rest of the house (not present). Good subtle and relevant music for the period. Movement of set/furniture worked well, blending into the performance – even though 2 slight mishaps – sheet of paper floating to the floor and not retrieved at the time as to do so would have been clumsy and noticeable – was left until the next scene and then removed with confidence, subtlety as if it was meant to happen that way – likewise whilst moving a table, the leg came off – again all credit to the actors who just carried on, rectified the situation calmly and carried on – all credit to them. The set was minimal, but extremely fitting with the time period – bed & canopy was really convincing.